We could all use more serenity in our lives. Where do you start? Building a private retreat? Going on vacation? Did you know that you can create a sanctuary within your home with just a few adjustments? 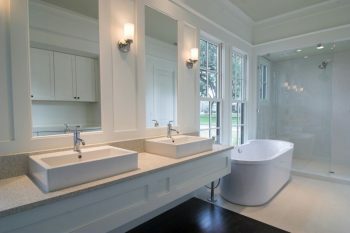 A minor bathroom remodel, yes, bathroom remodeling, can give you a place to escape from everything. Your bathroom is, in many ways, the most private area of your home. If you have children they’re more likely to give you time to yourself if you’re in the restroom than if you’re in your bedroom. When you wake up in the morning your first destination is the restroom. What’s more relaxing than a long, hot shower to unwind at the end of a long day? 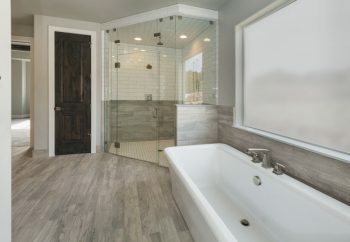 A bathroom remodel can be a very extensive project, perhaps taking months to finish, but that’s up to you. With just a few changes you can completely change up the look of your restroom. From there you can go further at a later date if you choose. When you’re planning to make a change, it can feel overwhelming. Where do you start? What type of look should you go for? The best advice is to consider one thing at a time. If you approach things in a logical manner, the overall project seems much more manageable. The colors in a room are likely the first thing that you notice when you enter. Try breaking your bathroom into three “color zones”. The primary zone is the walls, while the secondary zone is the window frames and door frames, the countertops and other surfaces. Your final zone is the accents, which include fixtures, doorknobs, faucets, handles, and so on. Each of these can be a different color, but you get a more serene effect when the colors are complementary. A good approach is to separate them into warm and cool colors. Neither “temperature” is necessarily more relaxing than others, but if you choose to go warm it’s best to avoid exceptionally bright shades. Cools include green, blue and violet. Yellows, oranges and reds are warmer. Metallic elements, such as your faucet, can be cool or warm, too. Bronze, brass, copper and other shades are warm. Aluminum, stainless steel, nickel, and titanium are cool. Don’t forget the effect of neutral colors. Black, white, and gray are all neutral, neither hot nor cold. They can coordinate well with any other shades. Your overall effect is largely dependent on your use of neutrals. For instance, if you have blue walls, purple trim, and a green floor, your bathroom definitely has a cooler look but is also very busy. For a more subtle effect choose white walls with say, blue trim and aluminum fixtures You still get a cool effect without getting overwhelmed. Direct lighting makes it easier to see what you’re doing. Examples include rows of lights around a mirror to help with makeup application or spotlights that you can direct to any angle. Indirect lighting allows you to see within a room, but it’s softer and has a gentler overall effect. Recessed fixtures tend to diffuse light for a more peaceful appearance. If you don’t already have multiple types of lighting installed, why not have your contractor set you up for both indirect and direct lighting? You can install multiple fixtures, each on their own switch. This allows you to turn on just the lights you need to see, or to get more direct lighting for when you’re shaving, combing your hair or putting on makeup in the morning. When you’re planning an aesthetic remodel, it’s still a very good idea to give consideration to any accessibility needs. Are you getting older? Does anyone who lives in or visits your home have mobility issues? Sometimes you can solve these with just a few metal grab bars to prevent slips. Has your family grown since you moved into the house? If so, you might need additional storage space for towels or bathrobes. Ideas: Professionals are plugged in to the most current design trends. You can catch up on what’s current, or go for something more original than what your neighbors are doing. Finishing: Sometimes you have the beginning of an idea, say one specific element in mind, but don’t know how to execute it. A design pro can give you plenty of ideas to tie in with your main concept. Execution: If your designer isn’t also a contractor, they almost certainly have connections with local remodelers. The more experienced and reputable your designer, the better the odds that you’ll work well with the contractors that they recommend. Whom you choose to work with your remodeling project makes all the difference in the world. As important as your bathroom is, you can expect nothing less than the best in terms of service, quality, and integrity. Here at Star Builders, we’re one of the most trusted businesses serving Marion County. Our team is very professional. The builders are all trained and very competent. We respect your personal space and leave your home looking better than when we found it. The job is as unobtrusive as possible, and when it’s done you’re left with something beautiful. We’ve won awards for achievement from the Oregon Remodelers Association, and once you work with us you’ll see why. Give us a call or use the contact form on this site to get us on the job today. Whether you’ve already got a plan in place or if you’re starting from the ground up, we at Star Builders can do it all, on time, within budget and to the highest specifications.